We stayed here over Labor Day and could not have asked for a more perfect weekend. The RV park was one of the nicest we've stayed in. The staff was very kind and friendly. We felt very welcome from the moment we arrived. The spaces are nice and wide, easy to get in and out of, and the views are spectacular. We will definitely go back!! We have stayed here before and enjoy this park!! We will continue to stay here when we are in Canon City area. Don’t be put off by the negative reviews. This is an excellent park and the negativity has to be coming from people who can’t follow the rules. We have never encountered any problems with the park or the staff. We will be back!!!! Stayed 3 nights. Would not stay again. Some staff was friendly, some not so much. Had problems with levelness on our site, and noticed that others did also. Did not use bathrooms or the pool ( closed ), did understand that the showers cost to use, after paying $50+ per nite. Had problems hooking up when ready to leave, but no one seemed willing to assist. My wife and I just got home from a 4 day stay at this campground. We had a great time. the campground was very clean and the bath/shower rooms were very clean. We found the staff very friendly and helpful. The only con we had is the electricity going out twice during our stay. We would suggest that a backup generator be installed as the water and electricity were both effected with the power outage. We are most certain to stay here again on our next trip to the area. There are SIX speed bumps just to drive into the park! Two would be more than enough. After driving bumpy roads and many hours, this just sets the tone of the park in a negative way. The lady at check in was rude. The guy in front of me turned to me and said, "we are way more patient then she is!" She never acknowledged him. You have to pay to shower. The pool is freezing. You can't have alcohol in the pool area. I understand not having glass, etc but we are adults. This could be an awesome campground but it is just so strict it takes the comfort out of it. No Refund- Staff has No personalitie- Wifi WILL NOT WORK with a Mac-Apple. No Cable-No Antenna Signal, Washer and Dryer are apartment size and the dryer very Small- $2.50 to Wash $2.35 to Dry. If you want to use their showers you must buy tokens and your time is limited, as they have to truck up their water. Fire Pits but the winds are so strong we were afraid to start a fire. You must pay Up front before you an reserve your sites. We were meeting family in their RV for a week in the Colorado. With No amenity we wanted to move-but there is no refund . My question to to Them was what if there was an emergency and I had to leave? He just looked at me and grinned. Worst experience camping . We reserved an Executive pull through site for our 5th wheel for a 3 day stay. The resort is very clean and the spaces are gravel and cement pads. Pet friendly with a lot of short walks around the resort on dirt paths. Two fenced in dog play areas. Sewer, water and electricity worked well. Internet was reliable and pretty strong. The camp is around 8 miles from the town of Canon City and 1 mile from the entrance to the Royal Gorge Bridge. The camp sits way back from Highway 50 so you do not hear any road noise. We had a very pleasant stay. If there is something close to perfection for the camping life, Royal View Campground would be ranked right up there. The camp grounds were immaculate with well leveled spaces and well thought out utility connections. We didn't opt for a view lot (costs more) but chose a standard lot and ended up with one which seemed twice as wide as the view lots. 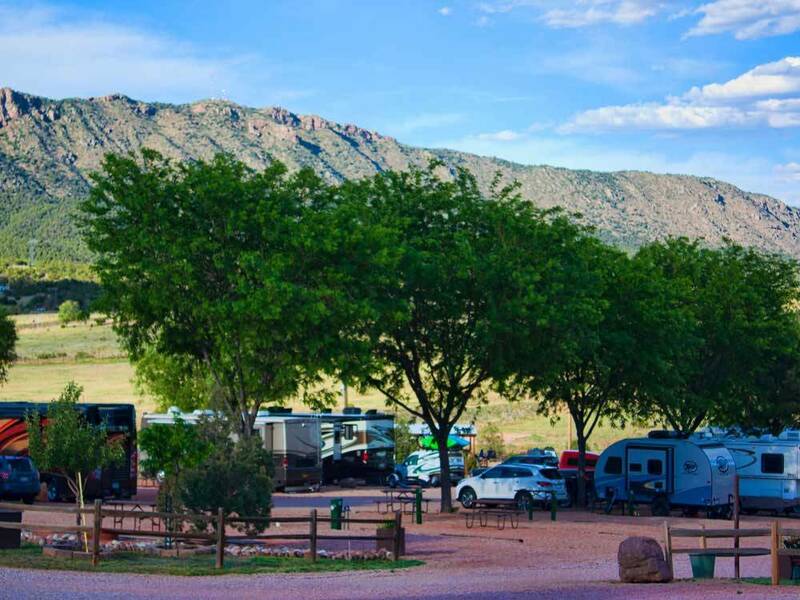 The campground is well laid out and provides many activities like a resort: mini-golf, playground, swimming pool, and the perfect viewpoint for a photo of the Royal Gorge Bridge at sunset. The staff was helpful, suggesting activities in the area and offering to set up tickets for a variety of activities. The facilities were spotless and seemed to be cleaned frequently. The campground store offered a nice variety of simple groceries and other items. I'd highly recommend this campground to anyone and it was apparent that it is a destination kind of place for returning guests. Great find! Very friendly staff, well kept campground and bathrooms. The view from our site looking at the Royal Gorge Bridge was awesome!! We stayed 7 days in August 2015. After seeing the other nearby campgrounds, I feel Royal View is the nicest location and best kept. The owner is very meticulous and strict. We did not have any issues, but other campers were being reprimanded to the point you worried about what you did. I talked with him every day and finally toward the end of our stay got him to crack a smile. Facilities are very clean and well kept, staff was friendly and accommodating. The pool area is very nice, daily outside temps were near 90 every day and the pool is advertised as heated, but was very chilly. We would stay here again in the future. The pros out weigh the cons.